The LSI MegaRAID 9361-8i SAS3 RAID controller is a 12Gb/s storage adapter featuring PCIe 3.0 host interface, 1GB DDRIII cache memory, 1.2GHz PowerPC 476 dual core 12Gb/s ROC, and 8 12Gb/s SATA+SAS ports. With twice the maximum data transfer rate of 6Gb/s SAS solutions, the 9361-8i delivers enough bandwidth to fully saturate the PCI Express Gen3 bus. Along with superior data transfer rates, the 9361-8i offers enterprise-class data protection and security and supports CacheVault flash cache protection. LSI first-to-market 12Gb/s SAS solutions, such as the 9361-8i, are geared for the performance and security demands of next generation of enterprise data storage. Any chance we can get some charts comparing it with the Adaptc 8 series, or were completely different benchmarks run? Going to be doing those next week. Originally we had only performed filesystem-level tests on those. We haven't worked with Areca at all, but as Kevin says, we'll get more data out soon on the 8-series. 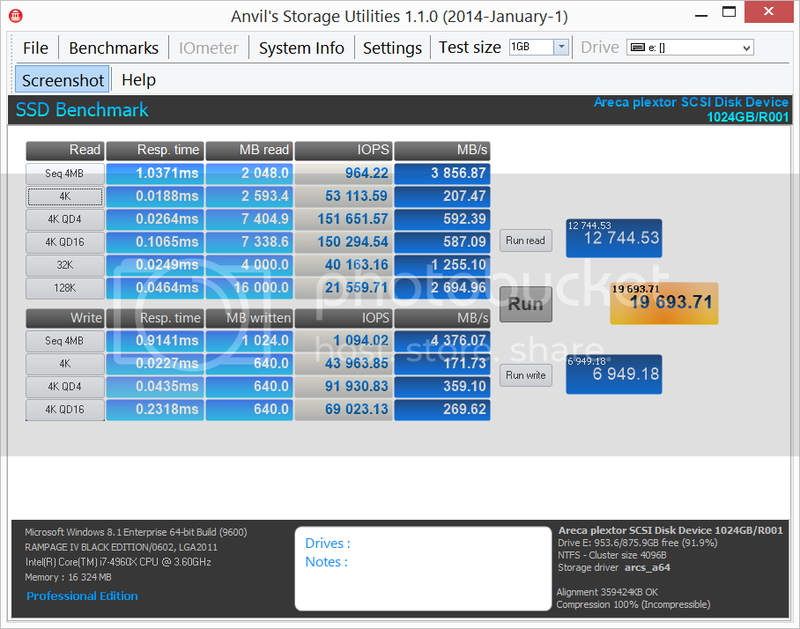 Interesting, why is raid 5/6 write iops performance so terrible? Do they used FastPath? I could get similar result with 8xS3700 and LSI 9270-8i without FastPath. 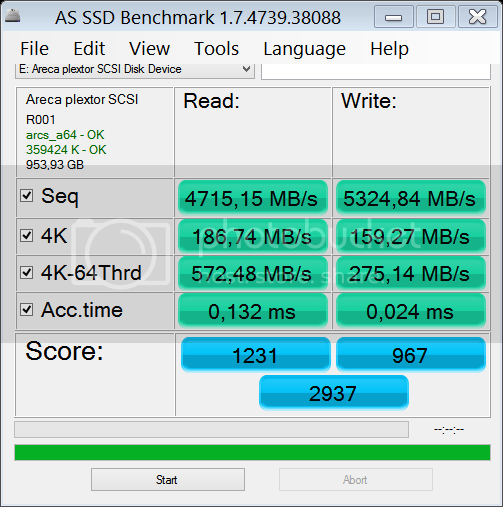 This is wrong on so many levels, why such a beast raid card is slowing down ssd disks? I can't believe LSI doesn't have a 16i or 24i version of the card! any notes about the reliability? Does anyone know if this card can use cachecade? What does SGL mean, I heard that more often, does it mean single perhaps?? So how much does it cost to buy an expander board, if they make them, to hook up 24 internal drives? ioconnor - I'm stuck in the same boat as you. I contacted LSI about needing more than 8 drives in my RAID. They suggested I get a 3rd party expander like the intel RESv240 (which is only 6g not 12G like the 9361). LSI said the 8i version of the card has more throughput than the 4i version so I'd be better off getting that. I asked if I could connect 2 cables to a 9361 to a RESV240 and still have 1 RAID 50 and LSI said I'd have to contact Intel. I contacted Intel and they said I'd have to contact LSI. LSI could make my life a whole lot easier fi they just updated the ancient 9260/9280 to a current PCIe, current 1 or 2GB cache, sata 12 like the 9361 but with 16 or 24i connectivity. I'd suggest that hopefully LSI gets better now that the sale has gone through. Remains to be seen how Avago invests though, we have no visibility into the new ownership, other than their sale of the storage assets to Seagate. That bit probably made sense. Just looking at this review and the IOPS figures for RAID 10 seem low for writes. Going through the maths the IOPS figures should be 8 drive RAID 10 means that the writes should be akin to 4x single drive performance which should give 280,000 IOPS but the reported figure is 97,391. Any idea as to why it is a lot lower than it should be theoretically for RAID10? It's not like it has parity to calculate so I don't see why it suffers such a large performance hit from this RAID level. Regarding the question about "SGL", I'm pretty sure it refers to a "non-kitted" product, meaning it does not come with cables. I just purchased one along with cables and yep ... it did not come with cables as I suspected. Glad I purchased my cables at the same time (saved a few bucks). I got confirmed that the test was done in "write through" mode. So this means that, unless anyone would prove otherwise, indeed its RAID 5 and 6 write performance for SSD RAID:s indeed is 25MB/sec per disk set. I wouldn't even touch that with rubber gloves! So seems anyone who wants data redundancy needs to implement that in software, as hardware simply not provides that, at least not with any performance whatsoever. Incredible, this is 2016, I would really have thought that we were past the 25MB/sec mark on top-of-the-line hardware. Anyhow, thanks for the reality check! The RAID 5 and RAID 6 benchmark figures are ultra-bad - the write speed has a 98% overhead (6k IOPS = 25MB/sec), and the read has an 80% overhead (130k IOPS = 500MB/sec), for the set of 8 drives. Like, really, so ultra catastrophic that I wouldn't even touch that card - and neither its OEM variant "Megaraid SAS3108". The recommended settings are to set "Write cache" to "Write through" mode, to enable "Direct I/O" mode, to enable "Disk's cache" (that is, the physical disks' own cache), and to disable the "Read cache" altogether. Perhaps absence of running the test with "CacheVault" would be an indirect reason for the crappy numbers - any thoughts on that? Any completing info on the SSD 4K RW IOPS in RAID 5 and RAID 6 with an actually healthy, proper configuration as described here would be much appreciated!! Please post your thoughts & actual benchmark results - thanks!! Sorry for spamming this topic again .Im just a noob in this field . I need your help to solve my question , I read a lot of documents but cant understand . Im using SAS2208 with 24x 6gb/s SAS drives , now I want to upgrade SAS2208 to this card 9361-8i .I dont know how much performance I can gain more?or not? Is the speed still 6gb/s or it will be increased to 12gb/s ? I agree, comeon SR, please provide DETAILS! ie what kind of backplane? or how are you connecting to the HGST drives? or more importantly, STATE that you are using Write Through. or use write back but with CV / Cap. backup! i mean really SR, i shouldn't have to come to the comments (which are usually blank for more articles), only to be fortunate enough that someone found out your tests were with write through and then posted that info here (thanks to the user for that post/info btw.). then, the one thing most ppl are looking for, a comparison of this card vs adaptec 8 series, you dont even run a apples to apples review on the adaptec. there is no basis for comparison between the two cards/reviews. Im sorry to be harsh, but im pretty disappointed.